A 7500 sq. ft. 6 Bedroom (plus a bunk room) 6 ½ bathroom two story log sided cabin on 2 acres. Floor plan features great room with gas fireplace, 70” HD TV, and separate playroom for young kids. Game room featuring 52” HD LCD TV, pool table, ping pong table and air hockey for entertainment. Kitchen features 2 sinks, 2 dishwashers, island, and breakfast bar, 2 built in refrigerators w/ice makers, 2 ranges (one gas, one electric cook top), with granite counter tops and plenty of seating to feed large groups of people. Covered L-shaped patio measures 100’ x 17’. A total of 5 gas fireplaces, in addition to central heating and air conditioning, 4 TVs all with satellite service, 2 DVD players, and wireless internet. All towels, bedding, dishes and cookware are included with your rental fee. Five bedrooms have king size beds; the sixth bedroom has 2 queen size beds, and the bunkroom has 1 king size bed and 3 twin beds. The three bedrooms downstairs each have their own private bathroom. The bedrooms upstairs share 3 full bathrooms. Three tankless hot water heaters. All rooms have ceiling fans. Horse stalls can accommodate up to ten horses for equestrian lovers. This property is on a paved road, located just over 1/4 mile from the National forest, where there are hundreds of miles of hiking, horseback riding, mountain biking, and ATV trails. Six lakes are located within 5 - 25 miles, where you can fish. Owner has lived in the White Mountains of Arizona since 1966. Has owned a local business, in Heber, for 14 years and knows the area well. 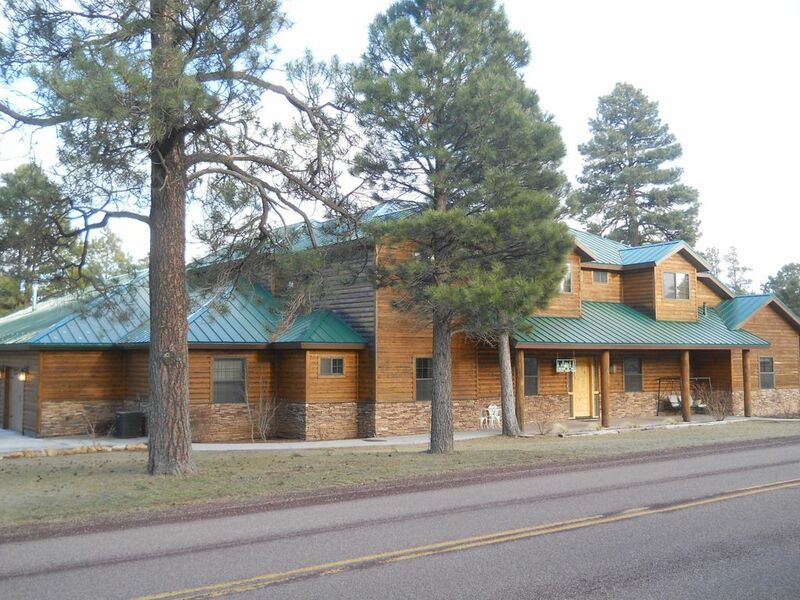 Close proximity to Phoenix metropolitan area, beautiful peaceful property with many tall Ponderosa pine trees, summer Monsoon storms, guided forest tours available, deer and elk on the property weekly. Large kitchen for large groups, large covered patio to accommodate outdoor summer meals, all bedrooms have walk-in closets, Wi-Fi, satellite TV, plenty of parking for multiple vehicles and horse trailers, ATV trailers, boats, etc. Crock pots, waffle iron, electric skillet, spices, misc. Fully stocked with multiple pots and pans, dishes, glasses, silverware, serving dishes, blender, can opener, cutting boards, knives, storage bowls, foil, plastic wrap, ziploc bags, towels, etc. Satellite service throughout the home. Ping pong table and air hockey. There is a pack n play baby crib available for your use. Our family had a great time! The cabin is huge, beautiful, modern, and western to go with it's local history. It was also very clean.The Clayton's were super accommodating and made us feel very welcome. The kids stayed busy day and night with everything there is at the cabin. We loved it!. We are very happy you had a good time! There sure is a lot of snow up there. I hope the kids got to play in it. Melanie and I hope to see you again. Cabin was in great condition. Tons of space for grown ups and kids. Game room was a huge hit with the kids. Lots of snow, sleds in the garage and a big yard for snowball fights. Nice out of the way location for quiet walks. Wifi wasn't good, but we didn't go to a cabin in the woods to be online. Check in and out was super easy. Beds were comfy. Kitchen was stocked with everything you could need. Big porch with lots of seating. As with most big houses that have an open to upstairs great room the temperature difference was noticeable between the two floors. Overall everything met or exceeded expectations and we'll certainly be back again. The owner was very helpful. Cabin was very clean. this is a great family home to enjoy any occasion. Thank you for letting us spend our Christmas weekend in your lovely home. The game room was a highlight to our own games. The kitchen was great. two ovens, two dishwashers, two refrigerators. Plenty of room for all our goodies. We are happy that you enjoyed your stay at the cabin and want to invite you back anytime. This cabin is breath taking! It managed to comfortably house 17 of us including two babies with room to spare! Boyd was a fantastic host and met us at the cabin to make sure all our questions were answered and to get us situated. The kitchen was stocked w everything we needed and we cooked A LOT! There were plenty of activities to keep the kiddos occupied and the adults got to relax. At the end of the trip, the kids didn’t even want to leave! When we are ready for another trip to escape the heat or a fun day in the snow we will be giving Boyd and Melanie a call! You won’t regret it, book this cabin! I'm glad you enjoyed your stay at the cabin. We look forward to your next visit. We are very happy you found us on VRBO and that you enjoyed your stay at our cabin. You are welcome back anytime!